The Compton organ, which is playable from a full four manual console, is installed in two over-stage chambers and originally contained the following units: Open Diapason, Horn Diapason, Concert Flute, Stopped Flute, French Horn, Tuba Horn, Trumpet, Clarinet, Tibia, Cello, Violin, Violin Celeste, Salicional, Vox Humana and Krummet. This last was exchanged at some time with the Orchestral Oboe from the Shepherd’s Bush Pavilion, resulting in the specification which exists today. The Theatre became an Odeon in 1963 and a series of concerts were held throughout the 1970s and early 1980s, the last being in 1982 after the orchestra pit had been covered over and a box constructed around the console to enable it to be raised. However, this arrangement had to be strengthened and made permanent for safety reasons, thereby entombing the console. 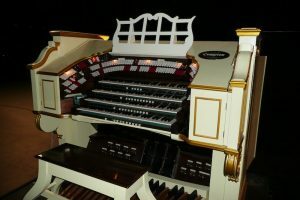 In 2007 the firm of HWS Associates were awarded the contract to restore the organ and, most importantly, re-connect the console to the chambers as the main cable had been severed at some time in the past. This work was completed in July, 2007. At the same time a new lift was installed to enable the console to be brought up to stage level for the first time in decades. Since this work was completed the organ has been featured a number of times in public and recently appeared on comedian Dara O’Briain’s 2010 DVD ‘This is the Show’ with Richard Hills at the console.